What's going on guys, it's Stuke here. In this installment of my Warrior series, we'll be looking at one of the most respected and praised gods in Greek mythology. 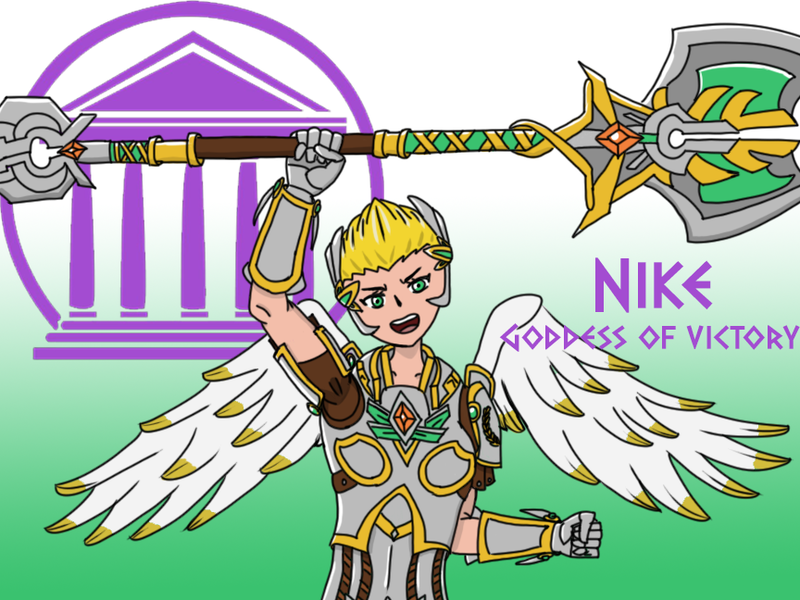 Today we look at the lady of the hour herself, Nike, the Goddess of Victory. Note: you don't have to follow this guide to the smallest detail, these are suggestions on how to play Nike. I encourage you to look at the comment section below and see other suggestions. Nike is a Physical, Melee, Warrior who uses her high aggression to pick off the enemy team's back lines and still have enough to get out with minimal damage. Using her power and high sustain with some crowd control, it makes her a strong fighter. An odd but very useful passive, after completing a certain goal both Nike and her teammates gain a boost in movement speed and power for each achievement. You hit your weapon twice in a line in front of you that can be charged up to deal a third hit with Plan of Action. Every hit that lands grant an additional benefit for each successful hit. Your first hit will be normal, the second will shred protections, and if the third hit lands your opponent will become disarmed. This is your main lane clearing and harassment tool, so be careful of any form of CC that can cancel you out of it, wait for them to waste it before using this ability. A two-part ability that serves for most of your utility both passively and actively. Each time you level up this ability, you gain a nice HpS which makes up for you not having any other way to sustain your health. When active, your next ability will do damage and gain an additional effect. You just hop (a little hop) that moves slow as f**k, but when charged up with Plan of Action you hop a bit faster. Oh, and you knock up anyone you land on in the process. After a very quick wind-up, you release a large AoE slow and you gain a health shield for a short duration. When charged with Plan of Action the health shield increases. Used as a team fight tool, you leap in and activate this to act as the meat shield and help the team take out any squishes who get caught in the slow. Like Amaterasu, you want to build like a supportive bruiser with a heavy leaning towards defense to make up for the lack of any healing ability and because your passive helps you and your teammates with damage and movement speed so no need to buy that many damage items. Items that provide protections, health/HpS, and CDR will be your focus so build into those and you'll be fine. Besides winning lane, your main objective is the complete all your goals to help the team. At least your team can help contribute to your passive so not everything falls on you when building it up. Utilize Nike's leap to gun for the back-lines and either cause a distraction for your team to collapse on or kill the mage or hunter sitting in the back waiting to be taken out. This combo makes full use of her ability to control a fight and deal a considerable amount of damage to divert focus on to you during the engagement. Do not fight, you will lose unless you are able to out push the opponent. Turtle under your tower and try not to die. At this point, you would have got boots online and one of the three goals too so you can finally go aggro proper. When you get all your goals achieved and build completed is where you start doing work at the enemy team. Run around and assist the team in fights and disrupt the enemy team. To summarize Nike, her ability to be a front-line striker who can give her teammates buffs to assist in team fights and objective taking. Always remember to focus on the back line to divert attention, complete your goals for the Late Game buffs, and keep the fights in your control. If you do all this correctly, then you will carry your team to victory. Replace Glad shield with beserkers shield. 136849 Kriega1 Replace Glad shield with beserkers shield. I'm not sure Berserker's Shield is a good item for her, I would stick with Gladiator's Shield instead. 136844 Gulfwulf I'm not sure [[berserker's shield]] is a good item for her, I would stick with [[gladiator's shield]] instead. No, I would definitely take Beserker's on her. She has cleave autos. 136848 Kriega1 No, I would definitely take Beserker's on her. She has cleave autos. I also use Gladiator's due to the CDR. But yesterday I thought about bulding Soul Eater on her, due to CDR and lifesteal, and I was pretty successful in my tests. However, when I asked Deathwalker about it on his stream, he said that Berserker's is the best choice for her. Now I’m conflicted. 136856 Vini_sds I also use Gladiator's due to the CDR. But yesterday I thought about bulding [[Soul Eater]] on her, due to CDR and lifesteal, and I was pretty successful in my tests. However, when I asked Deathwalker about it on his stream, he said that Berserker's is the best choice for her. Now I’m conflicted. Does glad shield proc on each hit of her 1? Then it could be decent, but otherwise I would stick to Beserkers. Also with Nike you want to build her really tanky in most cases so I would stay away from Soul Eater. 136861 Kriega1 Does glad shield proc on each hit of her 1? Then it could be decent, but otherwise I would stick to Beserkers. Also with Nike you want to build her really tanky in most cases so I would stay away from Soul Eater. Unfortunately no. Gladiator’s lifesteal only procs on the first hit of Rend. Well, Soul Eater would be the only damage item I’d build on her, and mainly for sustain. Unlike Gladiator’s, the lifesteal from SE procs in all strikes of Rend, both in gods and minions. Also, it works VERY well with Sentinel of Zeus, especially if you hit a lot of enemies during a teamfight. 136865 Vini_sds Unfortunately no. Gladiator’s lifesteal only procs on the first hit of [[Rend]]. Well, Soul Eater would be the only damage item I’d build on her, and mainly for sustain. Unlike Gladiator’s, the lifesteal from SE procs in all strikes of [[Rend]], both in gods and minions. Also, it works VERY well with [[Sentinel of Zeus]], especially if you hit a lot of enemies during a teamfight. Thats means Glad Shield is pretty irrelevant then in laning phase, in teamfights it's more useful, but that may depend on if you're rotating to get use from the passive, hitting her 1 and ult on mutliple gods in fights. 136866 Kriega1 Thats means Glad Shield is pretty irrelevant then in laning phase, in teamfights it's more useful, but that may depend on if you're rotating to get use from the passive, hitting her 1 and ult on mutliple gods in fights. Add mystical mail as an alternative item. 136301 Kriega1 Add mystical mail as an alternative item. Why do you prioritize Valiant Leap instead of Plan of Action? 135576 Vini_sds Why do you prioritize [[Valiant Leap]] instead of [[Plan of Action]]? If im against a lane bully I level Plan of Action over leap. 136303 Kriega1 If im against a lane bully I level Plan of Action over leap. I’m surprised to know you play Nike. 136839 Vini_sds I’m surprised to know you play [[Nike]]. I don't. It's very rare. Most of my playtime with her was on release where her 1 was busted, absolutely shredded people early game. 136850 Kriega1 I don't. It's very rare. Most of my playtime with her was on release where her 1 was busted, absolutely shredded people early game. For the leap, damage, and knock up. 135578 Stuke99 For the leap, damage, and knock up. I agree with Vini's question. I would personally prioritize Plan of Action for the various benefits leveling it bestows...including reducing CD. 135581 Branmuffin17 I agree with Vini's question. I would personally prioritize [[Plan of Action]] for the various benefits leveling it bestows...including reducing CD. Is just me or someone else can't play with Nike without at least 30% CDR? I think her cooldowns are too long and without her skills she is a big problem. 131875 xmysterionz Is just me or someone else can't play with [[nike]] without at least 30% CDR? I think her cooldowns are too long and without her skills she is a big problem. Although, good guide. For ability-based warriors, 20% is about the bare minimum CDR you want. Nike does have some pretty long CDs, but that's one of those things... Rend can be very powerful just with base damage, if she does the 3-hit combo. That said, that's also reliant on a 2nd ability...and when that's down, she has very little to offer, other than her ult. I would personally prefer it if they tweaked her kit a bit. Lower the CDs, decrease the damage dealt. As of now...yeah, I think I also prefer at least 30% on Nike. 131883 Branmuffin17 For ability-based warriors, 20% is about the bare minimum CDR you want. [[Nike]] does have some pretty long CDs, but that's one of those things...[[Rend]] can be very powerful just with base damage, if she does the 3-hit combo. That said, that's also reliant on a 2nd ability...and when that's down, she has very little to offer, other than her ult. I would personally prefer it if they tweaked her kit a bit. Lower the CDs, decrease the damage dealt. As of now...yeah, I think I also prefer at least 30% on [[Nike]].